If you do not have time to bake sourdough every week but have to feed your starter with flour, you might enjoy a recipe which takes only a short rise and is popped right into the oven. Recipes using sourdough starter can be augmented with baking powder, baking soda or yeast for a little extra rise and to save time. 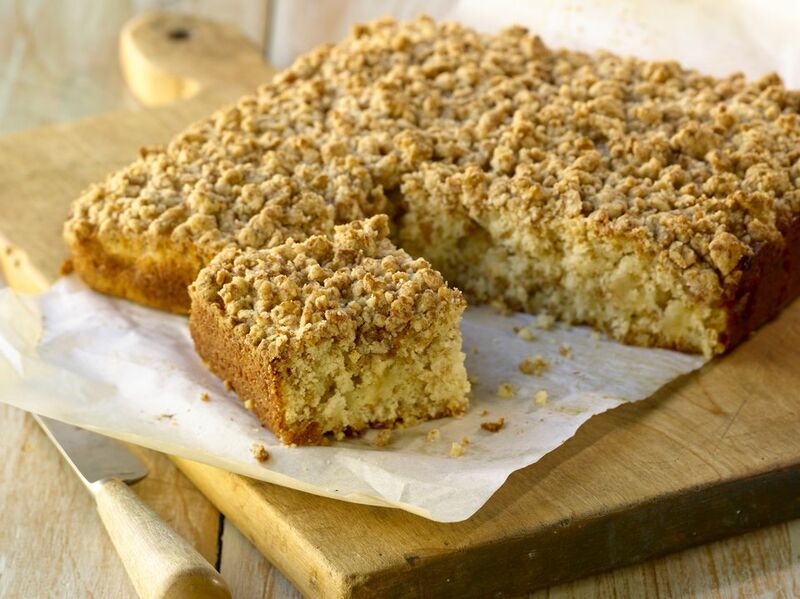 This streusel covered, sourdough coffee cake is delicious with coffee or tea. Note: The sourdough starter should be as thick as thick pancake batter, or about 50% flour, 50% water. I usually remove half the starter and feed both halves with equal amounts of flour and water, by weight, then wait for it to bubble up (about 4 hours) then put one jar back in the refrigerator for another week. The extra sourdough starter can be given to a friend or used in a recipe like this one. Mix the streusel topping first by combining flour, sugar, and cinnamon in a bowl, then rubbing the cold butter in with your fingers until the mixture is crumbly and sticks together if you press it between your fingers. You may use a mixer if you wish. To make the cake, place the sourdough starter in a bowl, add the rest of the ingredients and stir until combined. Pour the batter into a buttered and floured, 8- or 9-inch square pan or an 8-inch, round, layer cake pan. Smooth top and sprinkle reserved crumbs evenly over the batter. Let the cake rise for about 30 minutes in a warm place. Bake at 375 F for about 35 minutes, or until cake is set and the sides begin to pull away from the pan.